A New York Times bestseller Soon to be a major motion picture starring Elle Fanning! Theodore Finch is fascinated by death, and he constantly thinks of ways he might kill himself. But each time, something good, no matter how small, stops him. Violet Markey lives for the future, counting the days until graduation, when she can escape her Indiana town and her aching grief in the wake of her sister's recent death. When Finch and Violet meet on the ledge of the bell tower at school, it's unclear who saves whom. And when they pair up on a project to discover the "natural wonders" of their state, both Finch and Violet make more important discoveries: It's only with Violet that Finch can be himself--a weird, funny, live-out-loud guy who's not such a freak after all. And it's only with Finch that Violet can forget to count away the days and start living them. But as Violet's world grows, Finch's begins to shrink. This is an intense, gripping novel perfect for fans of Gayle Forman, Jay Asher, Rainbow Rowell, John Green, and Jenny Downham from a talented new voice in YA, Jennifer Niven. "At the heart--a big one--of "All the Bright Places" lies a charming love story about this unlikely and endearing pair of broken teenagers." -- New York Times Book Review ..".this heartbreaking love story about two funny, fragile, and wildly damaged high school kids named Violet and Finch is worth reading. Niven is a skillful storyteller who never patronizes her characters--or her audience." "...this heartbreaking love story about two funny, fragile, and wildly damaged high school kids named Violet and Finch is worth reading. Niven is a skillful storyteller who never patronizes her characters - or her audience." "In her YA debut, adult author Niven creates a romance so fresh and funny. . . The journey to, through, and past tragedy is romantic and heartbreaking, as characters and readers confront darkness, joy, and the possibilities-and limits-of love in the face of mental illness." -- New York Times Book Review ..".this heartbreaking love story about two funny, fragile, and wildly damaged high school kids named Violet and Finch is worth reading. Niven is a skillful storyteller who never patronizes her characters - or her audience." -- Entertainment Weekly "Many teen novels touch on similar themes, but few do it so memorably." --Kirkus Reviews, starred review "In her YA debut, adult author Niven creates a romance so fresh and funny. . . The journey to, through, and past tragedy is romantic and heartbreaking, as characters and readers confront darkness, joy, and the possibilities--and limits--of love in the face of mental illness." --Publishers Weekly, starred review "The writing in this heartrending novel is fluid, despite the difficult topics... Finch in particular will linger in readers' minds long after the last page is turned." -- SELF Magazine "It's touching, vibrant, and an impressively honest depiction of depression." 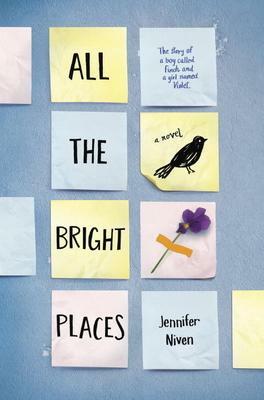 All the Bright Places is Jennifer Niven's first book for young adult readers, but she has written four novels for adults--American Blonde, Becoming Clementine, Velva Jean Learns to Fly, and Velva Jean Learns to Drive--as well as three nonfiction books--The Ice Master, Ada Blackjack, and The Aqua-Net Diaries, a memoir about her high school experiences. Although she grew up in Indiana, she now lives with her fiancé and literary cats in Los Angeles, which remains her favorite place to wander. For more information, visit JenniferNiven.com, GermMagazine.com, or find her on Facebook.